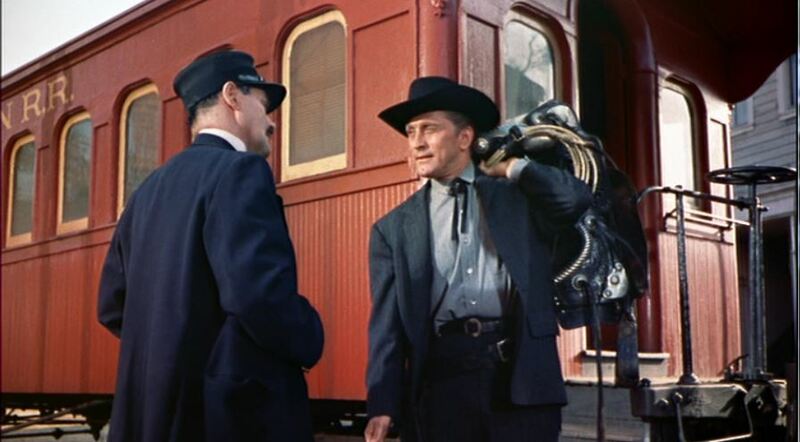 Kirk Douglas (as Marshal Matt Morgan) and Anthony Quinn (as Craig Belden) star in this very well done western drama about a lawman seeking justice for his murdered wife. 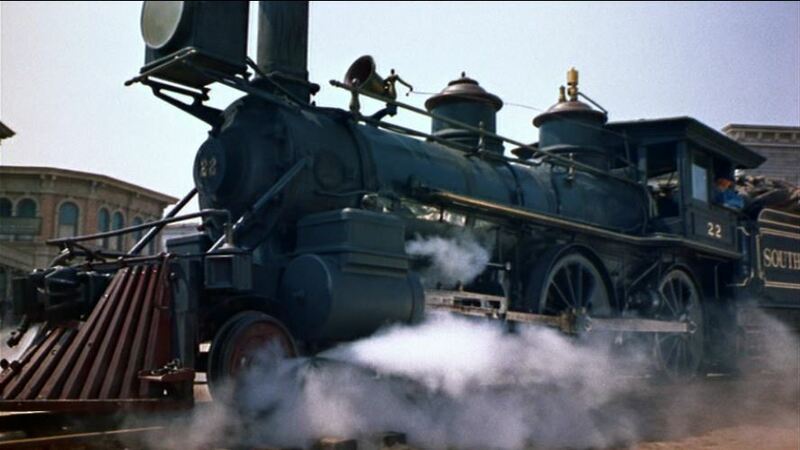 Of course, the REAL star of the show is Virginia & Truckee 4-4-0 #22, “The Inyo” back in the days when it was owned by Paramount. 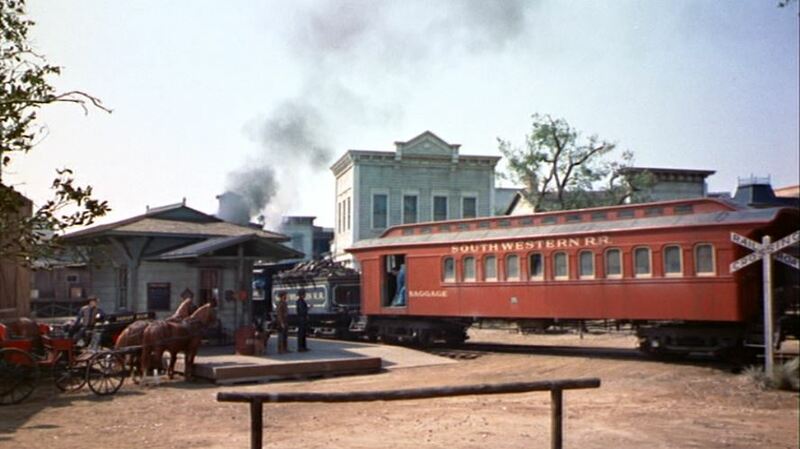 Indeed, most of its scenes in Last Train From Gun Hill are filmed on the Paramount back lot on a short stretch of track and in “town” on a movie set. V&T #22 lets off a little steam as it prepares to leave Gun Hill. 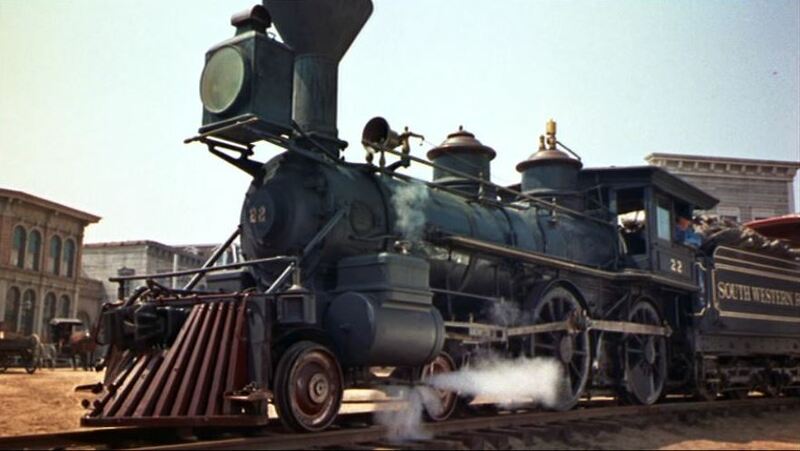 Built in 1875, the Inyo is still around and occasionally trotted out to operate at the Nevada State Railroad Museum in Carson City. 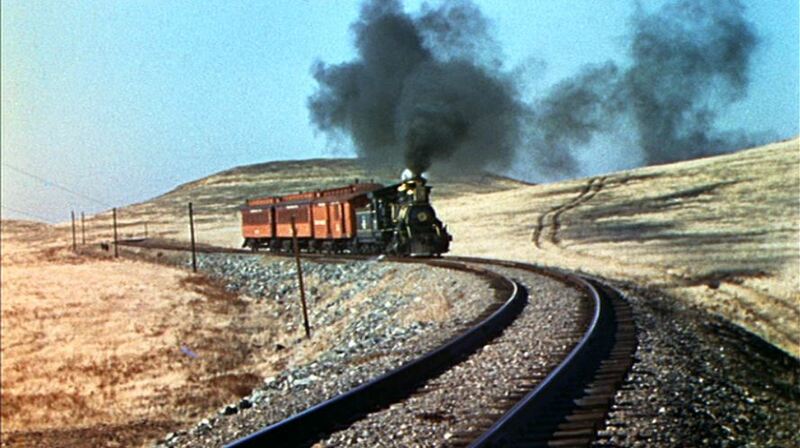 Our first train action finds a steam locomotive pulling a full baggage car and two coaches through the rolling hills. 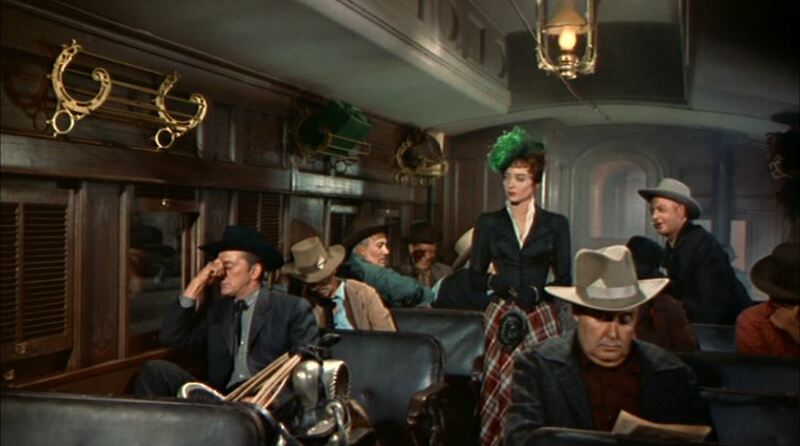 This appears to be a shot lifted from the Warner Brothers movie Dodge City 1939; Carolyn Jones (Linda) makes her way past the drummers towards Marshal Morgan. Got a light? ; Linda wastes no time in chatting up Morgan. 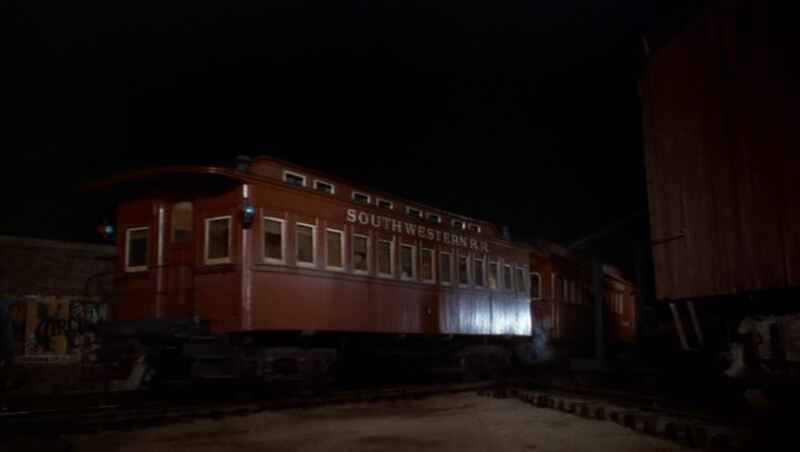 Good interior shots of the coach. 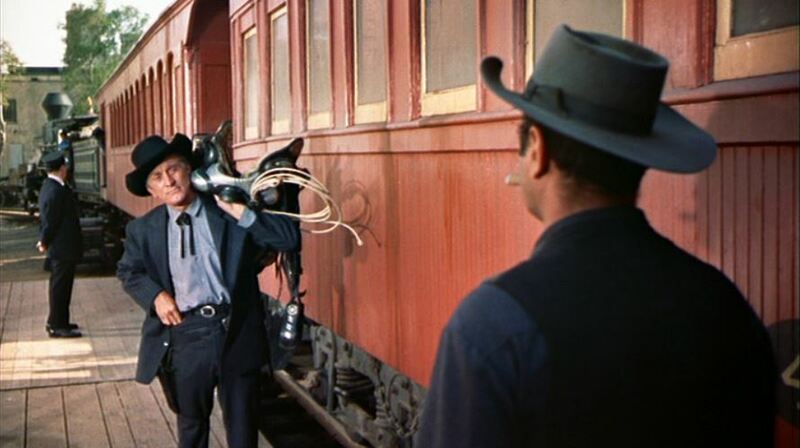 Note the ornate baggage racks and pot bellied stove in the background. 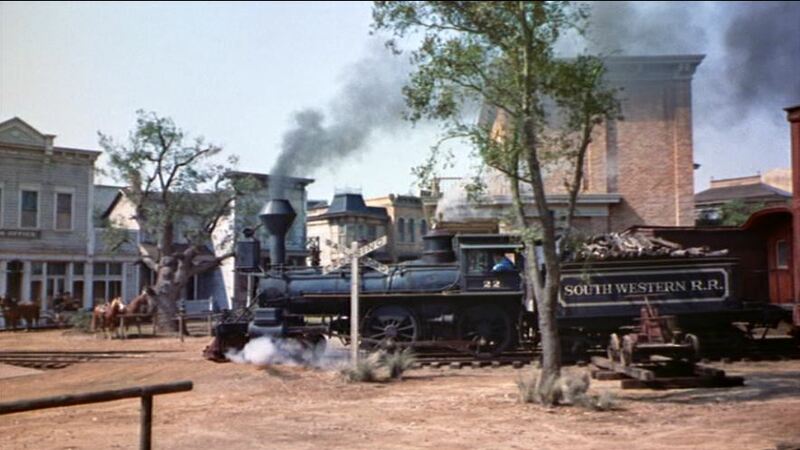 “South Western Railroad” #22 steps gingerly along the unballasted track as it arrives at Gun Hill. 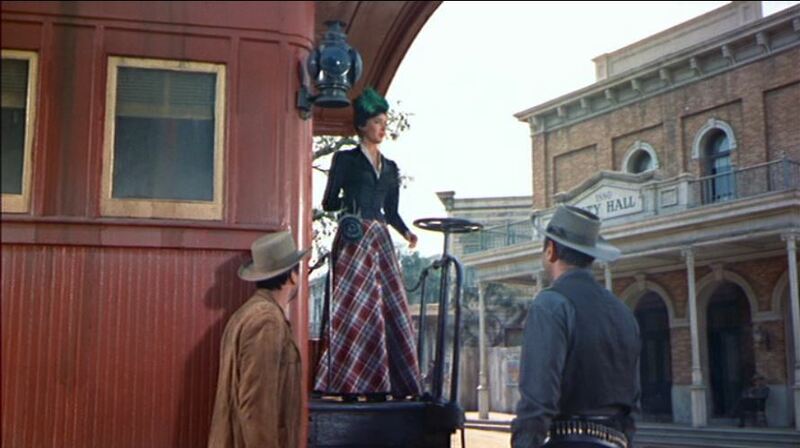 Low level shot of the Inyo; Linda is greeted by two of Belden’s henchmen as she stands on the rear platform of car #4. 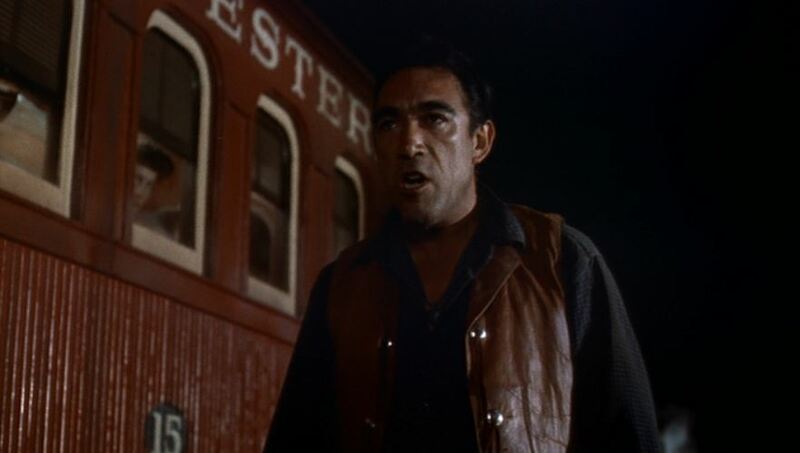 Morgan alights from baggage/coach #15. 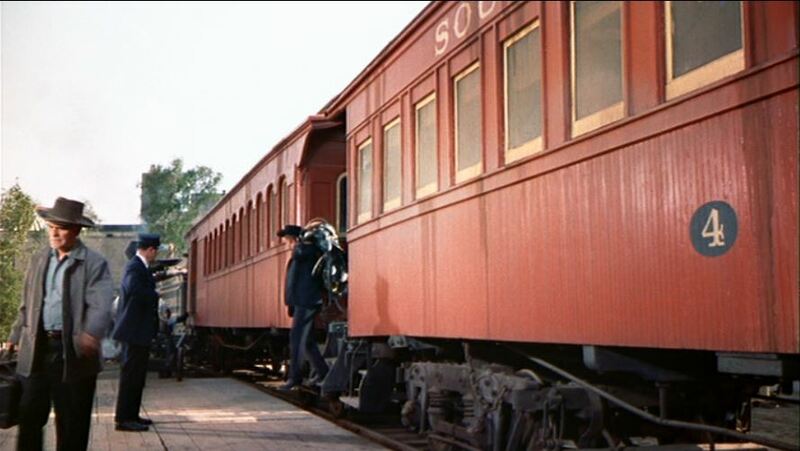 Hmmm…the full baggage car has gone missing and the coaches are now painted mineral red instead of orange. 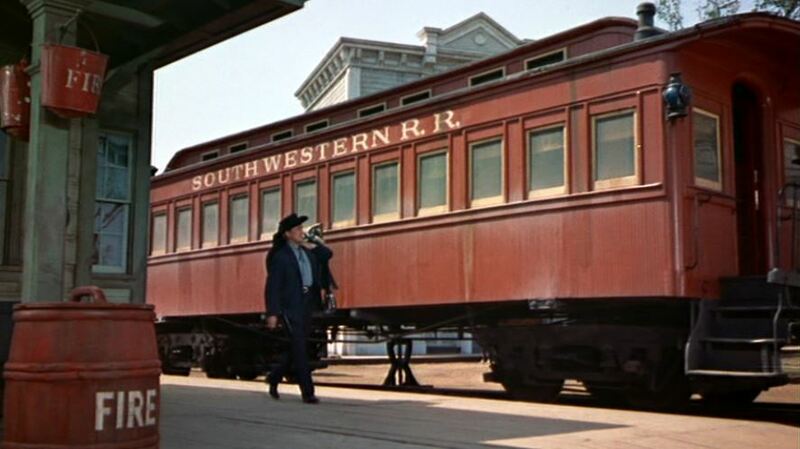 ; Good view of the henches and Linda with a nifty wood boxcar behind them. 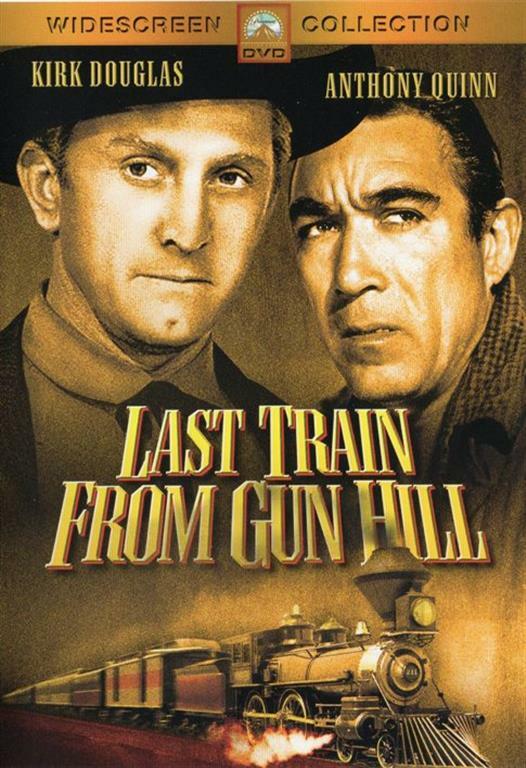 Morgan asks the conductor when the last train from Gun Hill leaves (9 pm); Morgan with saddle (key plot device) is confronted by one of Belden’s henches. Good view along the train. 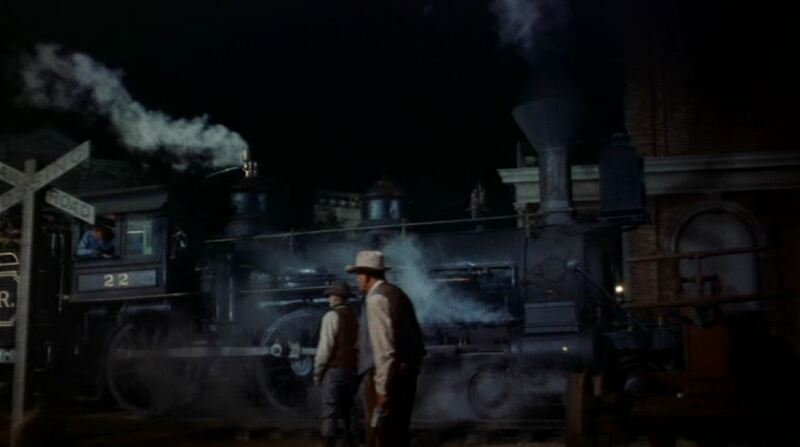 Marshal Morgan walks along the station platform as the train pulls out. A great deal of plot left off HERE. 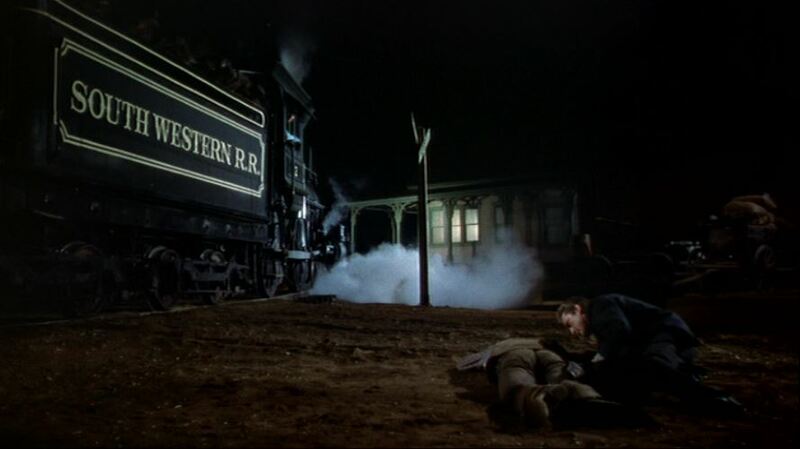 The Marshal wrangles his prisoner Rick (played by Earl Holliman) as the train steams into town; Morgan gets off a spectacular hip shot as Rick winces…hey, that’s (a much younger) Wilson! 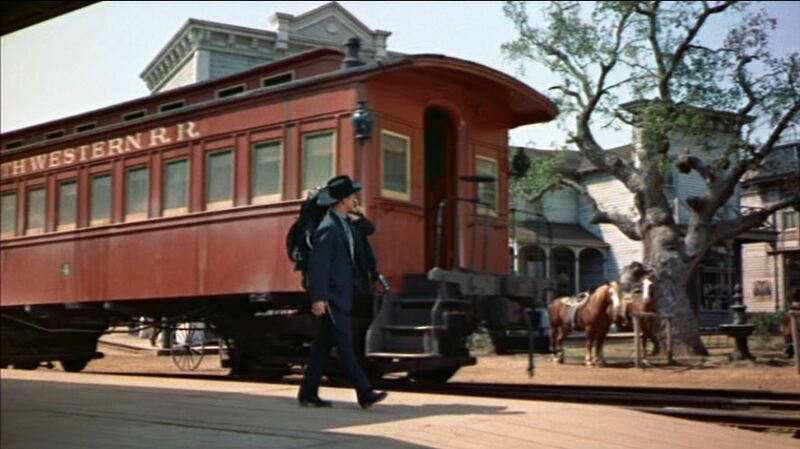 #22 comes charging into town. 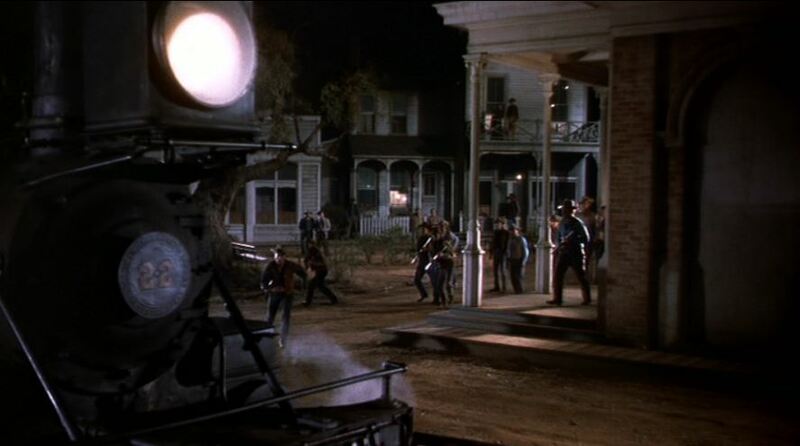 Dig that cool, lighted switch stand; The smokebox of #22 frames up nicely with the townsfolk running up to see about all that commotion. Dead. 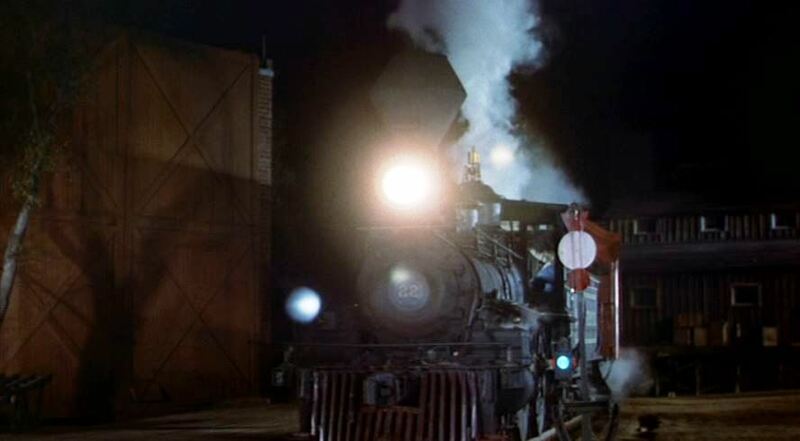 #22’s tender makes a stark background as the engine lets off a little steam; Uh-oh, here comes Anthony Quinn (Craig) looking for a little revenge (alongside coach #15). Great snarl. Draw! ; Did I leave the oven on? South Western RR #22 exits stage left as the train’s markers recede in the distance. 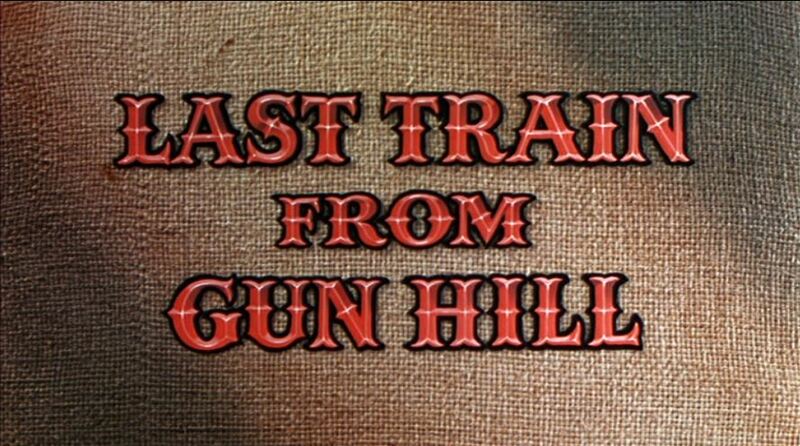 I really liked this movie. 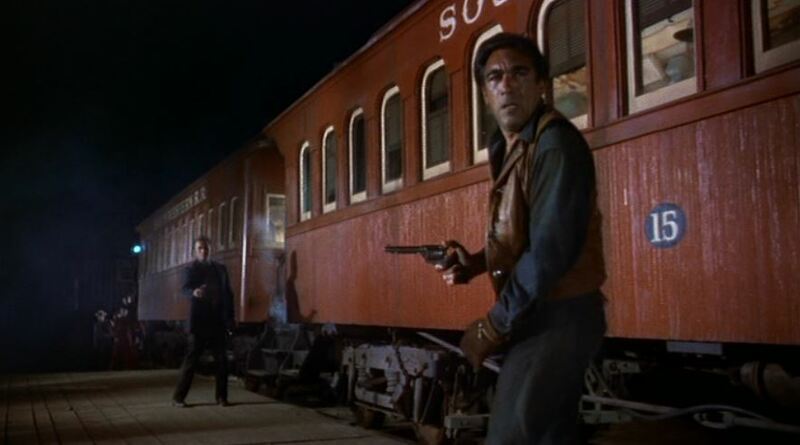 Putting aside the reviewed train scenes, Gun Hill has a great story line with twists and turns that will keep your interest from start to finish. 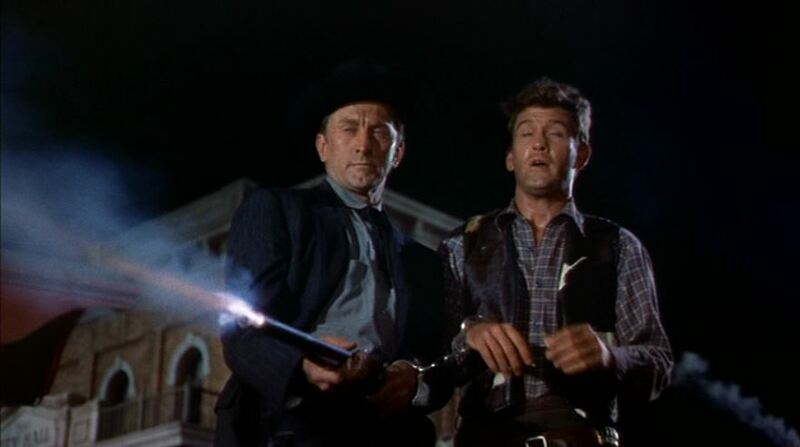 Most of the violence is implied, rather than gore thrown in our faces. 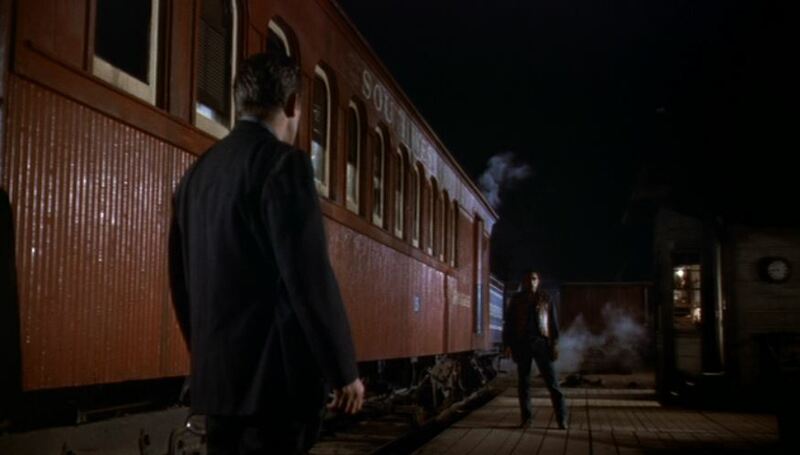 The resulting suspense leaves it up to the watcher’s imagination. 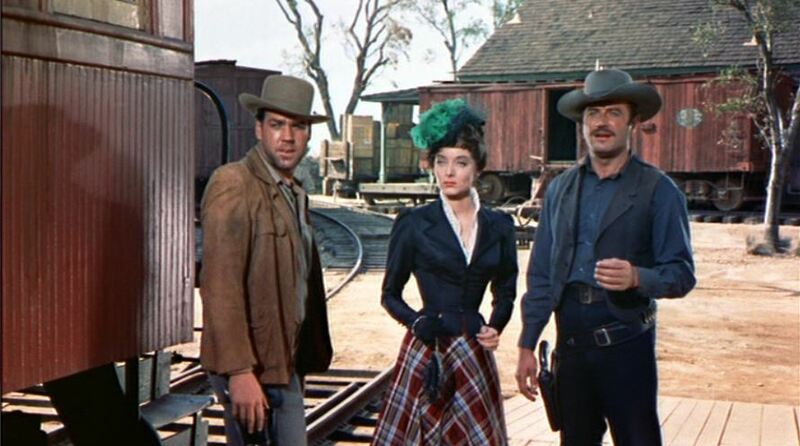 Sadly, Hollywood doesn’t make them like this anymore. Lindsay says check this one out! 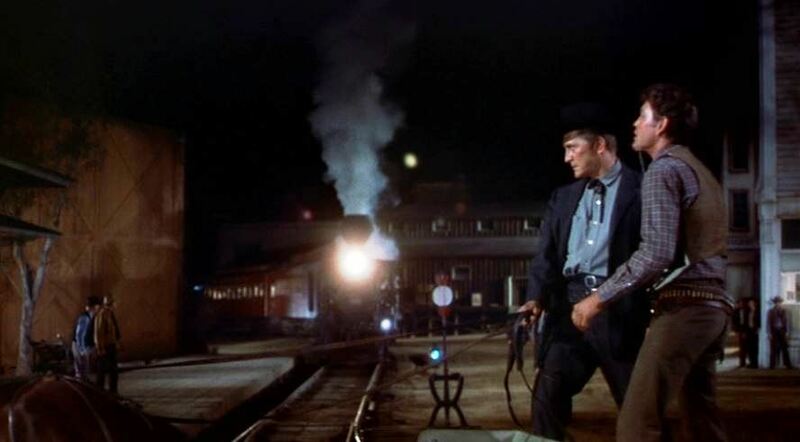 This entry was posted in Uncategorized and tagged Anthony Quinn, Carolyn Jones, Dodge City, Earl Holliman, Kirk Douglas, Last Train From Gun Hill, Nevada State Railroad Museum, Paramount Pictures, Southwestern Railroad, V&T #22 The Inyo, Virginia & Truckee. Bookmark the permalink.